Since our expedition back in 2000, ViewZone has been anxious to return to the remote canyons of Southeast Colorado to re-examine the petroglyphs that we hastily recorded on our last day of the trek. Specifically, we wanted to carefully validate the location and confirm the content of a highly significant collection of petroglyphs that we encountered on our way out of the hot and dry canyon of the Pergatoire River, located on public land in the Comanche National Grassland, just South of LaJunta, Colorado. Gary Vey has led four expeditions to document this ancient alphabet. He has found and translated ancient script in North America, Yemen, Israel and South Australia. Here, Gary is pictured in front of two common petroglyphs representing the names of deity "EL" and "Yah." "EL" represents the abstract form of deity -- that which cannot be comprehended by man -- while "Yah" is the Creator. Both symbols and concepts represent a single deity -- One God -- but recognize the aspects of "knowable" and "unknowable" deity. According to Expedition Director, Gary Vey, pictured above, this one collection of petroglyphs is perhaps the best example of the ancient alphabet in North America, proving that there was cultural contact between this area and the Middle East, around 3000 years ago. There are many petroglyphs in the Pergatoire River canyon. 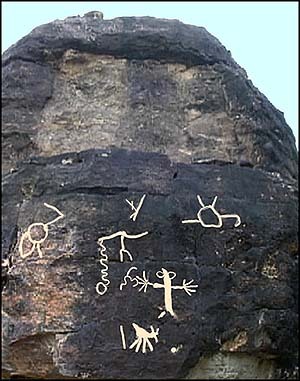 Many of these petroglyphs are attributed to Native American Indians who inhabited the region from about 1200 AD and until the arrival of the Spanish in the Sixteenth Century. A much smaller collection of petroglyphs has been identified in a very small area and appear very different from the widely accepted Amerindian art. The map above shows the areas where these unique petroglyphs can be found on public land. Often these older petroglyphs will be found underneath more recent Amerindian carvings and are distinguished by their "pecked" construction. 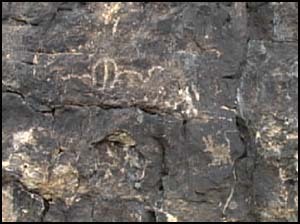 Most American Indian petroglyphs are, by contrast, scraped into the surface of the stone. In addition, the petroglyphs that are the focus of our expedition are all composed of combinations of a specific set of shapes or symbols described here. 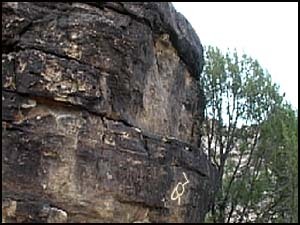 Notice the "step" or "seat" carved on the end of the large stone [above left] and then referenced in the petroglyph on the side of the stone [above right]. The view of the "seat" from the front is pictured below. The collection of petroglyphs have been enhanced to make them more visible in this photograph. 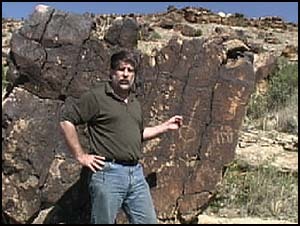 The petroglyphs have a layer of dark patina, or varnish, that makes them the same black color as the surface of the stone. This is evidence of their extreme antiquity but also makes them difficult to photograph. The particular collection we sought is associated with a uniquely shaped stone that appears to have been carved or modified in antiquity. The entire rock, as large as a house, is about 60 feet in length, fifteen feet wide and about fifteen feet high. On the Eastern end of the rock there is a ledge that forms a shelf [facing East 68 degrees]. The shelf is carved at a right angle, like a seat, with the back of the "seat" also showing signs of having been carved flat. The petroglyphs are found in two locations. The main collection is directly below the "seat" and face East on the narrow end of the rectangular stone. What makes the petroglyphs so significant is their lack of erosion and the simplicity of their message. The petroglyphs have already been translated and described in our last bulletin and can be reviewed here again. The central petroglyph alluded our prior translation but, upon close examination this time, we noticed that it was the symbol for "Het." This would make the entire top row read, from left to right, "YARE HA EL" or "Praise The Lord." We would strongly suggest that skeptics make the effort to visit these petroglyphs before dismissing this theory. We also would suggest that professional historians review the work of James Harris and the "old Negev" script that was documented in the Israeli desert during the Harvard Expedition in 1994. We have provided map details for this reason and we welcome any informed commentary. In addition to revisiting this previously documented stone, Viewzone also discovered a new collection of petroglyphs. These proved most interesting.